Scottie Lindsey gathers himself in the lane. The senior guard balled out in his final regular season game for Northwestern against Iowa on Sunday. Northwestern’s disappointing regular season came to a fitting end Sunday as the Wildcats fell 77-70 at Iowa. Playing without junior forward Vic Law, who sat out with what appeared to be a foot injury, NU (15-16, 6-12 Big Ten) struggled to contain the Hawkeyes’ (13-18, 4-14) offense, as the hosts shot 42 percent from the field. That effort was spearheaded by guard Jordan Bohannon who scored 25 points on 7-for-14 shooting, with all 14 shots coming from 3-point range. Iowa blitzed the Cats in the first half, scoring 45 points on 48 percent shooting. Senior guard Bryant McIntosh played only seven minutes in the loss and sat the entire second half as NU trailed by double digits. Senior forward Gavin Skelly joined him on the bench for the entirety of the latter frame after playing eight minutes in the first half. The duo combined for 2 points, a floater by McIntosh. In their place, senior guard Scottie Lindsey poured in a season-high 32 points to lead the way for the Cats. Lindsey shot 10-for-14 on the night, including an impressive 9-for-11 from deep, but it wasn’t enough to keep up with Iowa’s explosive offense. NU also struggled with foul trouble, as the visitors committed 18 fouls and the Hawkeyes made 17 of their 23 free throw attempts. On the other end, the Cats were 3-for-7 at the line. 1. Missing your best defensive player hurts on defense. Without Law, the Hawkeyes torched Northwestern’s zone defense so badly in the first half that coach Chris Collins was forced to switch back to man-to-man. The hosts rained down 3-pointers in the period, shooting 9-for-19 from the field and finishing 10-for-29 in the game. Bohannon opened the game 6-for-9 from deep. The Hawkeyes’ 77 points were the most NU has allowed since they gave up 78 to Penn State in early January. 2. For better or worse, Anthony Gaines is very confident. The freshman guard didn’t play his best game Sunday, making only four of the 11 shots he attempted, but his confidence is noticeable. Those 11 shots were the third-most on the team, behind Lindsey and sophomore guard Isiah Brown. 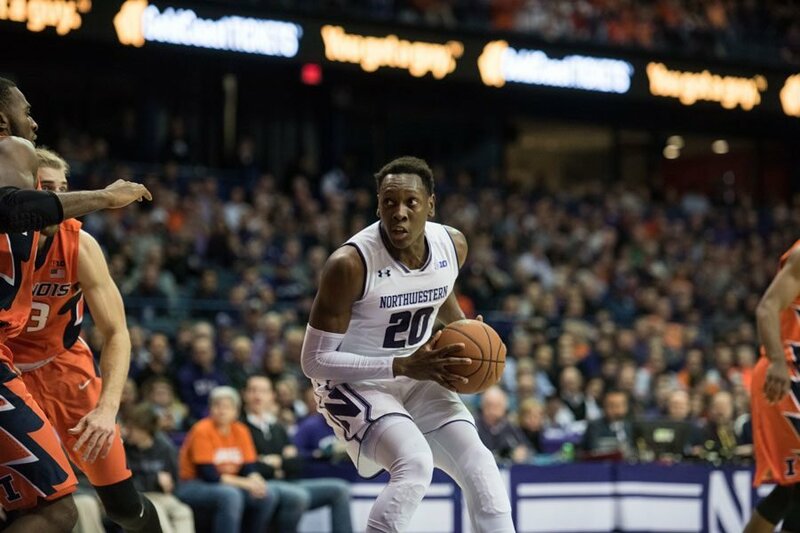 It took Gaines five games to take that many shots at the beginning of the year, but he has stepped into a larger role and played at least 30 minutes in five straight games for Northwestern as McIntosh and Law have dealt with injury issues. 3. Chris Collins is searching everywhere for answers. When redshirt freshman walk-on Tino Malnati makes an appearance in the first half of a conference game — even if it was for less than a minute — it’s a sign of desperation. As the Wildcats fell down double digits midway through the first half, Malnati made a quick appearance before the under-eight minute media timeout. But that wasn’t the only interesting lineup decision Collins made. Centers Barret Benson and Dererk Pardon played for various stretches together while Brown filled in for the limited McIntosh playing 33 minutes despite averaging only 10 per game entering the contest. A previous version of this story said that Iowa had lost 17 games this season. They have lost 18. The Daily regrets the error.